Carlos Quentin has played 616 regular-season games in the big leagues. He’s struck out 387 times. It’s possible that no pitcher has ever made him look worse than Yu Darvish did today. The Japanese sensation made his spring training debut against the Padres here in Peoria this afternoon, and it was electric. Well, sort of. Wednesday-afternoon baseball doesn’t usually draw big crowds in the Cactus League; there seemed to be twice as many people in the jammed press box as there were in the stands. But those who did make the trip or watched on MLB.com saw Darvish, one of the most hyped players the game has seen in years, flash the kind of pitches that made the Rangers pay nine figures to get him. Darvish’s strikeout pitch to Quentin was one of 10 swinging strikes that the Rangers righty induced out of 36 pitches, good for a preposterous 27.8 percent swinging strike rate (Michael Pineda led the majors last year at 11.8 percent). Small sample size of course, but Darvish made multiple hitters look bad in his two innings of work. He froze Cameron Maybin with a breaking ball for his first strikeout, punched out John Baker on a change, and threw a vicious curve to get Quentin. The big thing with Darvish was you couldn’t get a read on him: He changed speeds and also hitters’ lines of vision, working up and down, in and out, mixing his 92-95 mph fastball with a change and at least two kinds of breaking balls. Darvish even showed off his athletic ability, reaching to stab a James Darnell chopper up the middle and cut down a would-be run. He wasn’t perfect. After dropping a 12-to-6 hammer on Will Venable, Darvish came back with a 2-2 fastball that Venable absolutely murdered; if not for the 40-foot batting eye in center field, 410 feet from home plate, Venable would’ve had a home run. An inning earlier, Darvish elevated a fastball to Orlando Hudson, who whacked the ball past first base for a double. Granted, Human Statue Michael Young was the man who let the one-hopper scoot by him into right field. 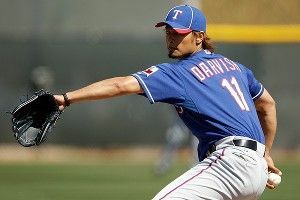 But Darvish missed his spot twice in his two innings, and served up two doubles as a result. Overall, it was a treat to watch. When he pitched, everyone was transfixed. You didn’t see fans texting or going for hot dogs when he was out there. The crowd oohed and aahed at his array of slow curves and darting changeups, and cheered loudly when he entered and exited the game, the only notable noise on a spookily quiet afternoon at the ballpark. When Darvish toes the mound next month for his first start that counts, you’ll have the same reaction. Few pitchers combine superior natural talent with an ability to make pitches sit up and do tricks. Darvish does. You’re going to love watching this guy pitch.